100% synthetic brake fluid on polyglycol basis for all types of hydraulic actuated brake and clutch systems in accordance with DOT 5.1, DOT 4 and DOT 3 manufacturers' recommendations. Specially designed for anti-locking brake systems (ABS). Mixes with DOT 3, 4, and 5.1 (not Dot 5). Dry boiling point: 272degC / 522degF. Wet boiling point: 185degC / 365degF. Standards: FMVSS 116 DOT 5.1 NON SILICONE BASE. Long life fluid: The high wet boiling point (185degC / 365degF), superior to DOT 4 (155degC / 311degF mini) and DOT 3 (140degC / 284degF mini) conventional fluids, enables the use of this product for longer periods. Indeed, DOT 3 / DOT 4 and DOT 5.1 brake fluids have the property to absorb humidity contained in the air, which reduces their boiling points and consequently security. The wet boiling point is representative of the fluid after one year of use. Specially designed for anti-locking brake systems (ABS): The viscosity (820 centipoises at -40degC / -40degF) lower than DOT 4 (up to 1800 cp) and DOT 3 (up to 1500 cp) brake fluids allows an easier fluid circulation in micro-valves of anti-locking systems. Perfectly neutral with seals used in braking systems. Anti-corrosion. 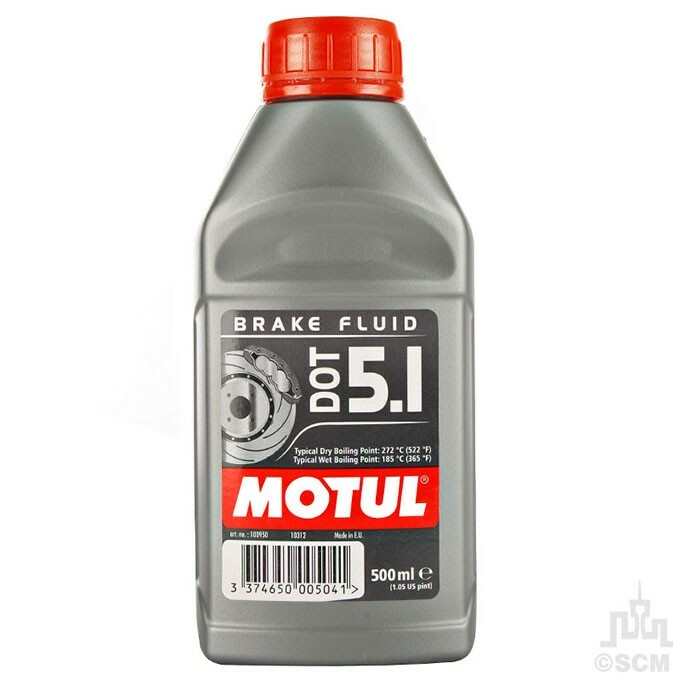 Motul DOT 5.1 Brake Fluid 100% synthetic brake fluid on polyglycol basis for all types of hydraulic actuated brake and clutch systems in accordance with DOT 5.1, DOT 4 and DOT 3 manufacturers' recommendations. Specially designed for anti-locking brake systems (ABS). Long life fluid: The high wet boiling point (185degC / 365degF), superior to DOT 4 (155degC / 311degF mini) and DOT 3 (140degC / 284degF mini) conventional fluids, enables the use of this product for longer periods. Indeed, DOT 3 / DOT 4 and DOT 5.1 brake fluids have the property to absorb humidity contained in the air, which reduces their boiling points and consequently security. The wet boiling point is representative of the fluid after one year of use.